The brain wires with experience so it is crucial that we allow children to have many experiences that will exercise their critical thinking skills. We want to expose infants and toddler to extensive “cause and effect” activities so that they learn about relationships that will later guide their choice of options when making a decision. Preschoolers will use what they have learned about cause-and-effect and they forge new thinking about how to solve more complex problem. 1. Provide cause-and-effect toys, experiences, and activities for infants. Even before a baby can understand your words, describe the cause-and-effect relationships that these toys, experiences, and activities have. Continue calling attention to these relationships as the children expand what they understand. 2. Ask toddlers questions that require them to think of new ways to do things. How can we make the sound of the rattle louder? How can we make it softer? How can we fill the bucket with blocks without touching them? Evaluation: Do you think it was okay for the small billy goat and the medium size billy goat to tell the troll to wait for their bigger brother? Why or why not? Synthesis: How would the story be different if the troll were friendly? Application: The troll used his ugly face to scare the goats. Can you think of other ways the troll could have frightened the goats? Analysis: Which parts of the story could happen in real life? Which parts are make-believe? 2. Ask questions. “What if” questions stimulate creative thinking and judgment questions exercise analysis and evaluation. What if children were in charge of parents? What if horses could ride people? What if dogs could talk? Do you think all these marbles will fit in this jar? Do you think it was all right for the Little Red Hen to refuse to share her bread? 3. Mix one cup beans, one cup salt, and one cup rice together in a bowl. Provide the children with a strainer and a colander and tell them to separate the items in the bowl into three separate bowls—one with beans, one with salt, and one with rice. After the children are successful, ask them if they can think of another way to accomplish the task. 5. Cut three to four sets of cat footprints and bird tracks from black construction paper. Tape the footprints on the floor with the bird prints perpendicular to the cat prints. The two sets of prints should meet at a right angle with only the cat prints continuing. Encourage the children to share their ideas of what happened. Children will guess things like the bird flew away, the cat ate the bird, and the bird hopped on the cat’s back. Ask the children if there is any way they can know for sure what happened. 6. Give the children two coffee cans and several smaller items to place inside the cans (a roll of tape, a small book, a crayon, a block). Have the children place one item in each can and then roll the cans. Ask the children to explore and notice how the items inside the cans affect the way the cans roll. 7. Science experiments and projects are filled with opportunities for critical thinking. Visit websites that provide simple science experiments and projects. Dr. Schiller is a respected curriculum specialist and freelance author and speaker. 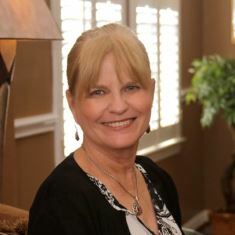 Pam has served as head of the Early Childhood Department at the University of Houston. She is the author of six curriculums, 18 children’s books, more than 30 teacher and parent resource books, and a number of other creative projects such as activity books, DVDs and CDs.